Founded in 1874, the Yale Club of Washington, D.C. is among the oldest and most active in the world. Organized as a tax-exempt, 501(c)3 non-profit entity, the Club serves the interests of Yale University, its graduates, and students in the greater Washington, D.C. metropolitan area. Annually interviewing local students applying for admission to Yale College through the Alumni Schools Committee (ASC). Offering continuing education and intellectual stimulation by bringing Yale faculty, administrators, and friends to the area; organizing talks, discussions, and other presentations by alumni and other speakers. Fostering social and professional interaction among members by organizing networking and professional, singles, young alumni, special interests, All-Ivy, sporting, and performing arts events. Embodying Yale's spirit of service through a variety of volunteering opportunities throughout the Washington area. Building awareness of programs, services, and happenings in Washington and New Haven through mailings, newsletters, e-mails, and regular updates to our website. 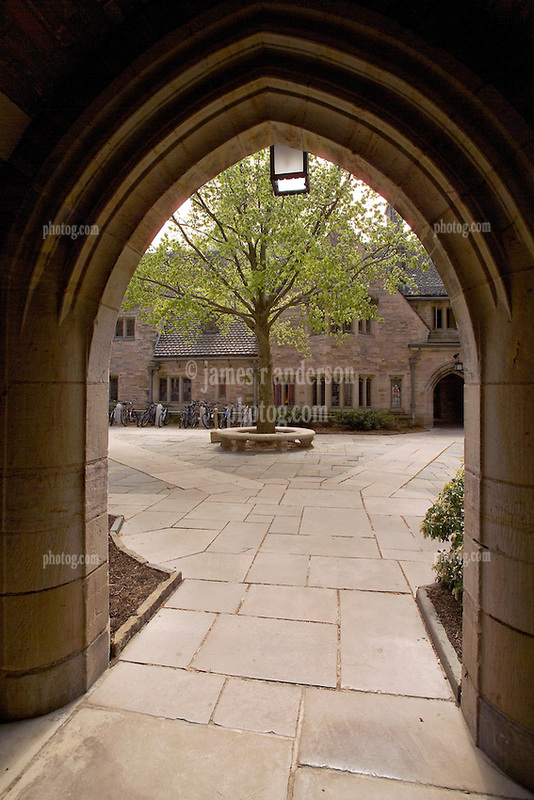 All graduates of Yale University (undergraduate, graduate, and professional), Yale educators, students, and their parents are invited to join the Club and take part in shaping its life and direction. Payment of annual dues entitles members to advance notice and lower prices at club events, access to the member directory and bulletin boards, and admission to select "members only" events. To join or renew your membership with the Yale Club of Washington, D.C., please fill out the New Member Application or Membership Renewal Form. 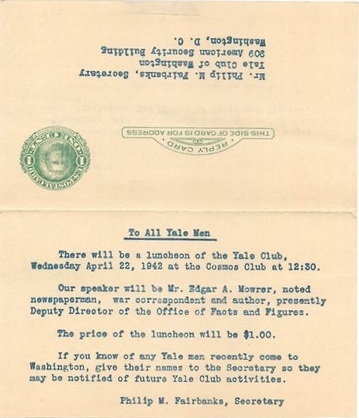 What was the salutation in the invitation to attend an activity meeting with a speaker on April 22, 1942? "To All Yale Men"
Who was the speaker? "Mr. Edgar A. Mowrer, noted newspaperman, war correspondent and author, presently Deputy Director of the Office of Facts and Figures."